With a total of almost 1 million samples, Vienna Dimension Strings is by far the most ambitious and time intensive production in the history of the Vienna Symphonic Library. This release unites Dimension Strings I and Dimension Strings II into a powerful Strings Bundle. The recordings in Vienna’s famed Silent Stage started as early as fall 2008 and took around four years. The 24 string players (8 violins, 6 violas, 6 cellos and 4 double basses) were recorded in homogeneous groups, capturing all of the human interactions and slight imperfections of a live performance. Individual microphones for each player allow you to access each voice of the ensemble. 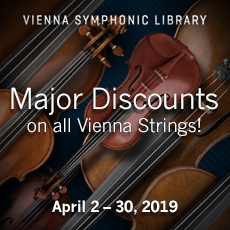 The Bundle includes both Vienna Dimension Strings Collections at a reduced Bundle price and comes with the free Vienna Instruments player. To make the most of these unique multi-dimensional samples, we recommend using Vienna Instruments Pro.